Protesters from France's "gilet jaunes" (yellow vests) movement have pulled out of a meeting with PM Edouard Philippe scheduled for Tuesday. The "yellow vests" have been protesting about a controversial fuel tax since mid-November. "Yellow-vests" are so called because they have taken to the streets wearing the high-visibility yellow clothing that is required to be carried in every vehicle by French law. President Emmanuel Macron has accused his political opponents of hijacking the movement in order to block his reform programme. Mr Macron has also cancelled a planned trip to Serbia to concentrate on the crisis. Culture Minister Franck Riester told reporters that Mr Philippe would announce "a strong conciliatory gesture in the coming days", without giving details. Mr Philippe also spoke with leaders of the opposition on Monday. Far-right leader Marine Le Pen, who was at the meeting, warned that Mr Macron could become the first president to give the order to open fire on his own people in 50 years. Finance Minister Bruno Le Maire met business representatives to assess the damage caused to businesses over the weekend. The "gilets jaunes" movement began as a protest against a rise in duties on diesel - which is widely used by French motorists and has long been less heavily taxed than other types of fuel. 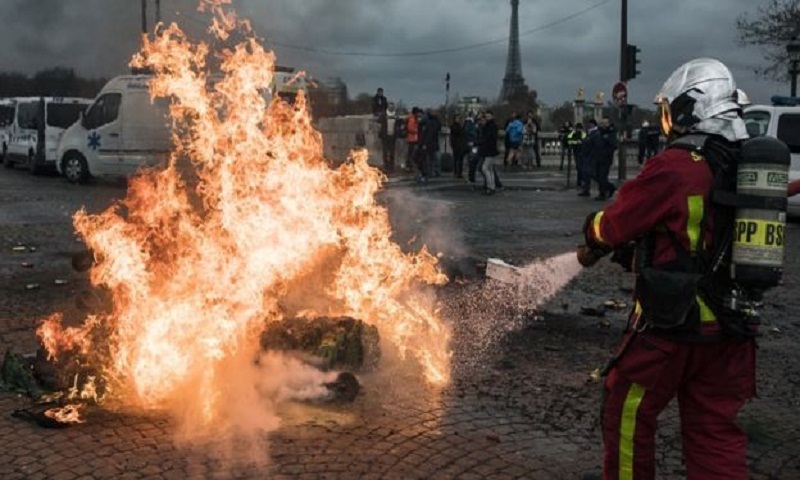 The movement later grew to reflect a range of grievances, including the marginalisation of rural areas, high living costs, and general anger at President Macron's economic policies. The protests have no identifiable leadership and gained momentum via social media, encompassing a whole range of participants from the anarchist far left to the nationalist far right, and plenty of moderates in between. Protests continued into Monday. About 50 "yellow vests" blocked access to a major fuel depot in the port of Fos-sur-Mer, near Marseille, and petrol stations across the country have run out of fuel.